Inversion Therapy is the technique that uses gravity to decompress your damaged spine, while hanging upside down. It relieves the pressure on your spinal column and back pain caused by spinal stenosis and other complications. The therapy is an effective method to ease back pain in a short time. It must be kept in mind that the therapy is not a permanent cure and consulting a physician is perpetually a better choice. 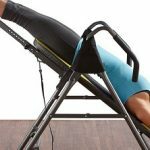 Inversion Therapy is done using inversion tables, gravity boots, etc. Inversion tables are the most popular. Fix your table on a flat surface and make sure that all the connections and settings are proper. Adjust the table to match your height. Check to see if you can rest your head comfortably on the table; it should not be dangling over the edge. Read the instruction manual thoroughly before proceeding. Stand against the table and place feet in the footrests. Fasten your legs in place with the straps provided. Make sure they are fixed tightly. Move on to securing all the straps on your body. Different tables have different locks, so refer to your instruction manual and make sure everything is strapped in place. Secure your body on the table. Use the side handles to straighten yourself into a horizontal position. Stay in this position for a minute. Push back slowly and turn yourself upside down at 25 degrees. You can choose an angle according to your comfort. Breathe deeply and be still for 2 minutes. 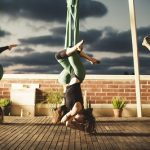 Beginners can find hanging upside down disorienting, so start small and then make your way to staying in the position for 10-20 minutes. Raise your arms above your head to make the traction more effective. This stretches your spine and back muscles. Stay in this position for as long as you are comfortable. Keep working up to this angle for five-ten minutes a day, for a week. Increase the angle of inclination by 15-20 degrees gradually. Do this until you are comfortable staying at an angle between 60-90 degrees. Workout two to three times a day, every day or when your back is hurting. Change your routine according to the level of pain you feel. 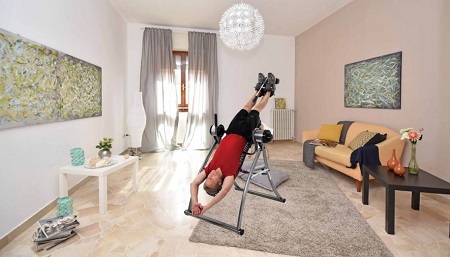 Since Inversion Therapy is a temporary solution, use the table regularly but excessively. Use handles to return to a horizontal position. Do this very slowly to avoid the feeling of nausea or dizziness. Stay until your breathing evens out and then step away from the table. Have a person stand by and watch while using the table. Consult a physician before starting the therapy. Patients suffering from glaucoma, having high blood pressure and pregnant women are advised not to use this therapy. Invert yourself slowly and not in one rapid motion. 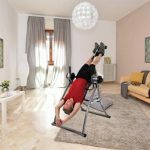 Inversion Therapy can prove to be helpful if used cautiously. Following this guide carefully will free you from chronic back pain in no time.